LG may be having difficulties with its flagship phones, but the company's budget devices have always sold well. 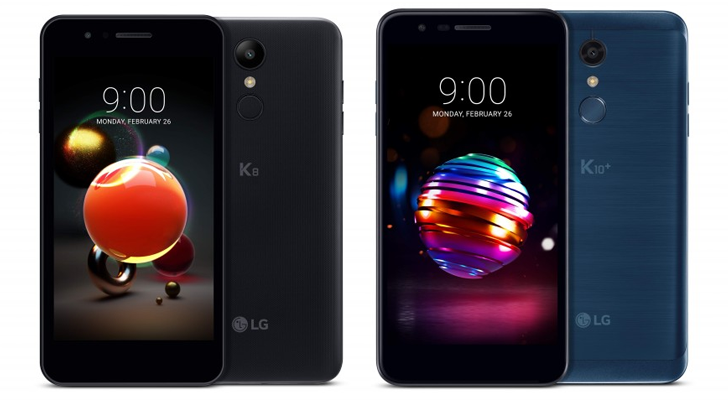 LG has produced various inexpensive phones under the 'K' brand since 2016, and at Mobile World Congress, it will show off 2018 versions of the K8 and K10. Both phones look a bit different than their 2017 predecessors. The LG logo has been moved to the back, and the top phone speaker now matches the black front panel. Love it or hate it, the glossy metal back is still here. Sadly, the reduced bezels from the Q6 haven't trickled down to the K series quite yet. The 2016 K10 currently goes for around $100, so if the new model is in that price range, it doesn't seem half-bad. Unfortunately, the phone is still running Android 7.1.2, which is over 10 months old at this point. There's not much else to say about this phone - if it stays roughly the same price as last year's K8, it should be decent. Again, LG has opted for Android Nougat instead of Oreo, but phones in this price range almost always have outdated software. Both phones will be shown off at Mobile World Congress next week, so we'll likely see more photos of the devices at that time. The devices are primarily aimed at Europe, Asia, Latin America, and the Middle East, so they might not be sold in the United States (at least initially). SEOUL, Feb. 22, 2018 — LG Electronics (LG) will unveil the 2018 edition of its popular K8 and K10 mass-tier smartphones at MWC 2018, enhanced with even more premium features rivaling those of premium flagships. Both models will roll out globally in key regions such as Europe, Asia, Latin America and the Middle East. With a host of advanced camera features such as high speed auto focus and noise reduction for better low-light photography, the new K Series continues to deliver exceptional products to customers at exceptional prices. Both the K8 and K10 carry over the handsome glossy pebble identity that has been a key element of the K Series’ identity, complemented by its 2.5D Arc Glass design for a modern, seamless look that ages well with time. Both phones will be available in three new, striking colors for 2018: Aurora Black, Moroccan Blue, and Terra Gold. Visitors to MWC 2018 can experience the new K8 and K10 at LG’s booth in Hall 3 of Fira Gran Via from February 26 until March 1.